Point guard missed final three games of conference finals with hip injury. WALTHAM, Mass. 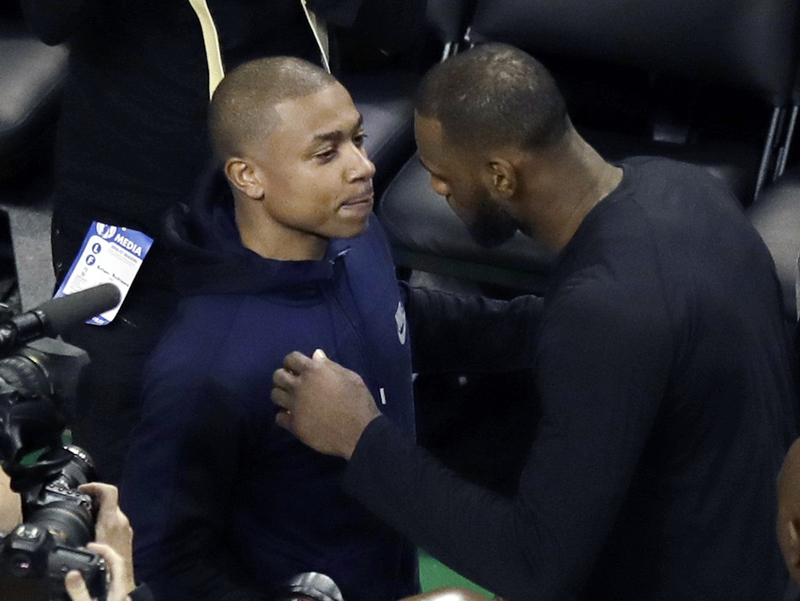 — Celtics star Isaiah Thomas says it’s too early to tell if he needs surgery on his right hip. The injury knocked the Boston point guard out of the Eastern Conference finals in Game 2. Although the Celtics won the next game without him, Cleveland went on to win the series in five games. Avery Bradley one game. Kelly Olynyk another. Marcus Smart stepped into the starting lineup, and rookie Jaylen Brown helped out from the bench. The Boston Celtics showed this postseason that they have players who could fill in for Isaiah Thomas when the star point guard was injured. But they also showed how badly they need him. Bradley scored 23 points on Thursday night, but for the third time in as many home games the Boston Celtics were trounced by LeBron James and the Cleveland Cavaliers. The defending NBA champions won 135-102 in Game 5 to advance to the NBA Finals, where they will play the Golden State Warriors for the third consecutive year. James scored 35 points, passing Michael Jordan on the NBA’s all-time playoff scoring list along the way, and Kyrie Irving had 24 for Cleveland. Kevin Love had 15 points and 11 rebounds before joining the rest of the Cavaliers starters on the bench for the fourth quarter – a familiar scene in the series. Aside from a Game 3 upset after losing Thomas to a hip injury, the Celtics lost by margins of 13, 44, 13, and 33 points. The Celtics never led in any of the games in Boston, trailing by as many as 50 in Game 2 and 39 on Thursday night before both teams emptied their benches. After signing Al Horford in the offseason – the biggest free agent acquisition in the history of the NBA’s most-decorated franchise – the Celtics rode him and Thomas to the No. 1 seed in the East. They lost the first two games at home in the first round against Chicago, then came back to win four in a row. They beat Washington in seven games, including a Game 2 victory in which Thomas scored 53 points – one shy of the franchise playoff record. Thomas had his front tooth knocked out in Game 1 of the conference semifinals against Washington, but it was a lingering hip injury he aggravated later in the series against the Wizards that would end his season prematurely. After playing three halves against the Cavaliers, the Celtics said Thomas was done for the season. He watched Game 5 in street clothes. “Obviously we didn’t want I.T. to go down. The way he’s playing, he’s deserving of all the credit he’s getting,” Irving said before listing some of the Celtics who shone in Thomas’ absence. “All their guys, they’re just dedicated to basketball. They’re coming out and they’re hitting us, they don’t care who you are. A young team with its core signed, salary cap space and the No. 1 overall pick in next month’s draft, the Celtics have a chance to add a maximum contract player as a free agent and another potential star in the draft. Bradley promised that the Celtics would be better in 2017-18.